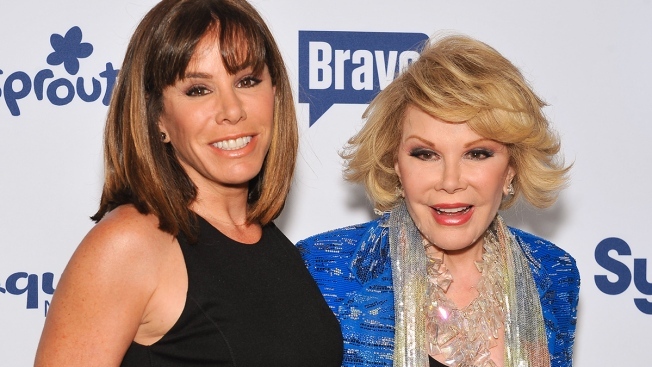 Joan Rivers (R) and daughter Melissa Rivers attend the 2014 NBCUniversal Cable Entertainment Upfronts at The Jacob K. Javits Convention Center on May 15, 2014 in New York City. During a "Fashion Police: Remembering Joan" special, Melissa Rivers confirmed that the show will continue without Joan Rivers. "Yes, Fashion Police will continue. We're going to hit pause for a little while, but Fashion Police will be back in January." She went on to say, "I really want to thank all of the Joan Rangers for the outpouring of love and support, it has meant so much to Cooper and me. From the bottom of my heart, thank you." Joan Rivers passed away earlier this month at 81-years-old after suffering from complications while undergoing a throat operation in New York City. Her daughter, Melissa Rivers released the following statement: "It is with great sadness that I announce the death of my mother. She passed peacefully at 1:17 p.m. surrounded by family and close friends. My son and I would like to thank the doctors, nurses, and staff of Mount Sinai Hospital for the amazing care they provided for my mother." She continued: "Cooper and I have found ourselves humbled by the outpouring of love, support, and prayers we have received from around the world. They have been heard and appreciated. My mother's greatest joy in life was to make people laugh. Although that is difficult to do right now, I know her final wish would be that we return to laughing soon."